We know how daunting it can be going for treatment when you are not sure what to expect and you may have had enough of the injury or illness. When I first went for KCR I had spent a lot of time (years) seeing physiotherapists, chiropractors, Doctors, consultants, massage therapists and didn’t want to tell my story again for what felt like the millionth time. Over years working with clients and continued training we look you as a whole person. The injury can be a small part of a bigger picture. THESE ARE JUST SOME OF THE QUESTIONS AND THOUGHTS THAT WE HEAR. “What do I have to wear?" "Will treatment help (insert condition)"
On arrival to The Barn please come in, we may be finishing with clients so please make yourself comfortable and we'll be with you as soon as possible. You will be offered a glass of water and we'll have a discussion about anything that may be relevant to your condition, we may discuss things like your occupation, activity / sport, diet, stress, sleep, and anything else which may be affecting your health. At your initial consultation especially, we’ll ask a whole loads of questions about your symptoms. During treatment (KCR /CTR) you will be fully clothed during your appointment so please wear something comfortable to move around in. Jeans are not great to work on or move around in! KCR is a non invasive treatment, we want you to feel safe, relaxed and comfortable. Read more below about what to expect in each treatment. We’ll ask you to sit up, lie on your back, on your front and move from side to side for realigning the whole body. During the treatment you may experience different sensations, I often hear things like “ouch”, ‘oooo’ ‘the feels painful, but like a good painful, ‘I feel like I’m floating’ to ‘I’m feeling something moving from my hip to my ankle’. It’s all really amazing to hear, the human body fascinates me! But YOU are in control and can say ‘STOP’ at any point. Working on connective tissue we’ll work specifically in an area of your body you’ve been feeling pain such as your knee or parts of the spine. You may already be thinking . . . What is Ayurveda? How will it help me? Will I have to make drastic changes? We’ll have a chat and I’ll be asking common questions such as “What symptoms you’ve been having?”, following on with questions about your diet, your occupation, lifestyle, activities you take part in and so on. You’ll be given some suggestions of things to change in your diet and be given a diet sheet away with you to help adapt your meals. 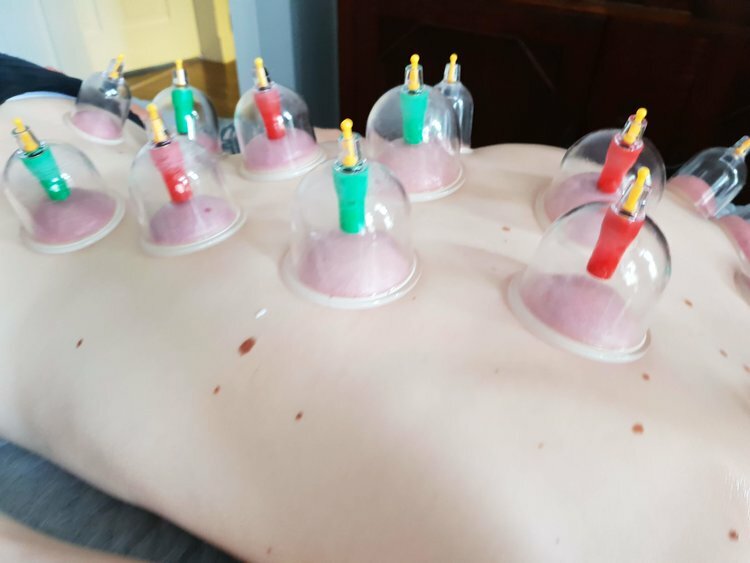 We advise a cupping session after you’ve had an initial KCR treatment. KCR is effective in aligning the body and it’s always our first treatment. Everything else - yoga, cupping, Ayurveda can all help once the body is balanced through KCR. We’ll start asking questions about your symptoms, which symptoms have improved, any new symptoms that may have appeared. You’ll be asked to remove your clothing for the cups to be applied directly to the skin. You may feel a slight tightness or nippy feeling when cups are applied.